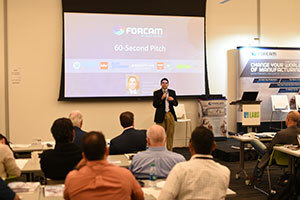 Predictronics showcased its predictive maintenance technologies to end-users and original equipment manufacturers (OEMs) Oct. 26 at FORCAM’s Third Smart Factory World Symposium in Chicago. CEO Edzel Lapira, Chief Technology Officer David Siegel and Data Scientist Matthew Buzza attended the event, which focused on digital manufacturing and the Industrial Internet of Things (IIoT). 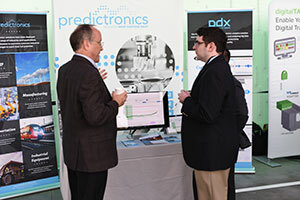 In addition to giving a 60-second pitch to manufacturers, Dr. Siegel engaged with attendees at a booth where he, Dr. Lapira and Buzza demonstrated the value of Predictronics’ innovative solutions. When introducing new technologies in a manufacturing environment, start small, fail small, but start now. Manufacturers that choose to wait until a new technology has been proven out will fall behind the competition. Instead, they should start with a proof of value or subset of the manufacturing line. If the value is provided in this initial study, they can deploy the technology to a wider set of machines in the production line. If the proof of value is not successful, manufacturers are able to quickly overcome the failure and avoid the waste of significant resources. Most companies do not provide all the necessary capabilities in a manufacturing 4.0 factory. It is essential to collaborate with end users and machine OEMs, as well as companies providing predictive analytics and connectivity services, to achieve that vision. Predictronics has taken this message to heart, which is why it fosters collaborative partnerships with companies such as FORCAM and other technology leaders in the industrial space. Some companies starting out their manufacturing 4.0 journey are at the early stages of data collection. Others have been collecting data for years and are not looking to add any more sensors to their process. This diversity in data volume highlights important aspects. One is that the transition from small data to big data can happen quickly, as companies enable machine connectivity and sensor data collection. Collecting quality data at the right time, for the right objective, is a necessity. Analytics and pattern recognition have also become essential as data volumes increase, given the unpracticality of manually inspecting numerous data channels. Now more than ever, manufacturers are interested in predictive maintenance technologies. We at Predictronics like to think it is because of advances in our company’s technology, as well as improved marketing and sales campaigns. In reality, it may have more to do with an overall industry trend and interest in the benefits of predictive maintenance. Still, the level of excitement and interest surrounding this topic is much higher than it was only two years ago.